: He's unconscious with serious injuries, but nothing life-threatening. : And with his training regime, his body should recover pretty quickly. : Is it okay to enter the infirmary? : Sure, I don't mind. : ...Rainfall is good for the soil, hm. : ...Like the rain falling on the city, there is weeping in my heart. That was the poet Rimbaud, I think. : No... It was Verlaine. : This doesn't even count as a scratch. : Well, hearing you say that makes me feel better. : (.........) You know... There's something I wanted to ask... Do you mind? : You don't have to answer if you don't want to. But, I... I wanted to apologize for being inconsiderate. : No need for that. 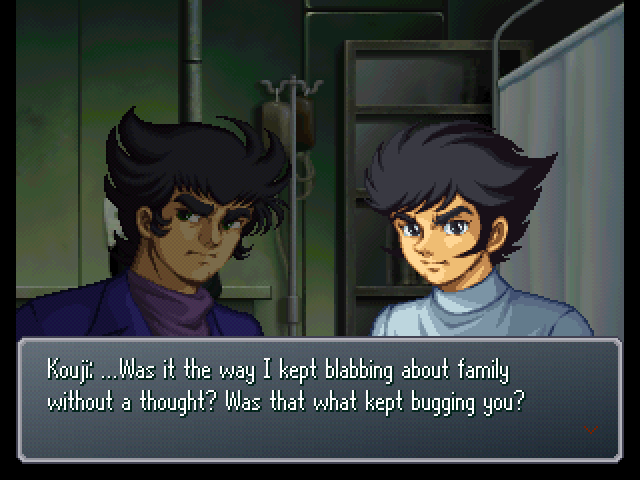 I lost my parents early on too, and I've been fighting all this time... Kenichi's group had to put up with their dad being used by the enemy, and Hyouma and Ryo both grew up like I did... My resenting you was nothing more than my own self-pity. : So, I'm the one that owes you an apology. : ...I have one more question for you. 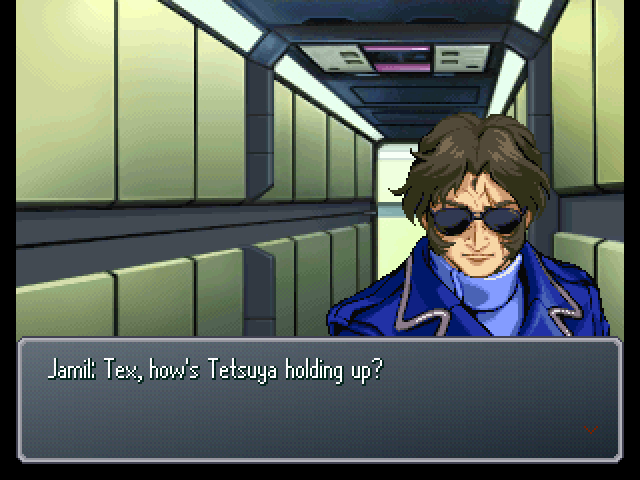 You didn't answer before, but... Do you even want to go back to our time, Tetsuya? : Up until yesterday, I couldn't have cared less about the Space Era... But now, it's different. I... I have to find a way back to our time, so I can fulfill a promise I made to the man I call Father. : ...Yeah, it's the person I said I'd introduce you to, before the last fight with the Aerogators. That's two promises I have to keep. I'll make it through this battle and find a way back. 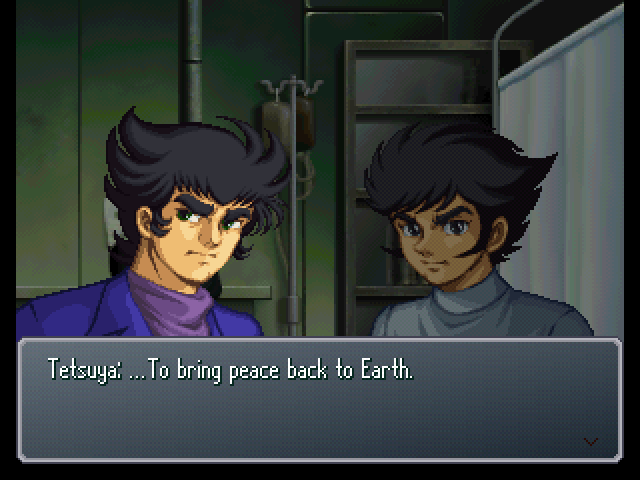 : Tetsuya... Let me help you keep that promise. 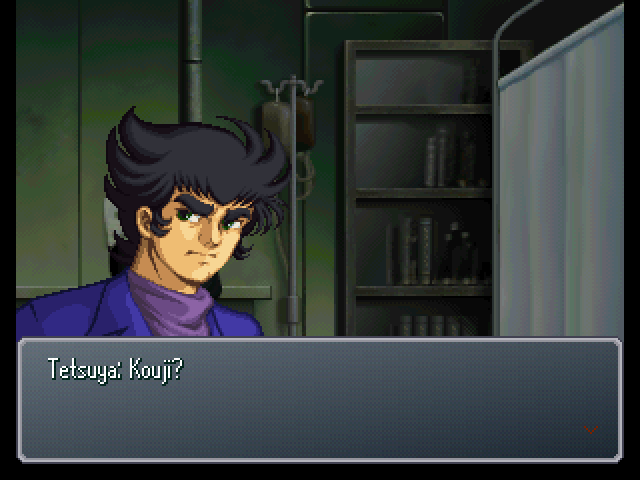 : Yeah... of course I will, Kouji. : So I want to apologize, and get it out in the open. 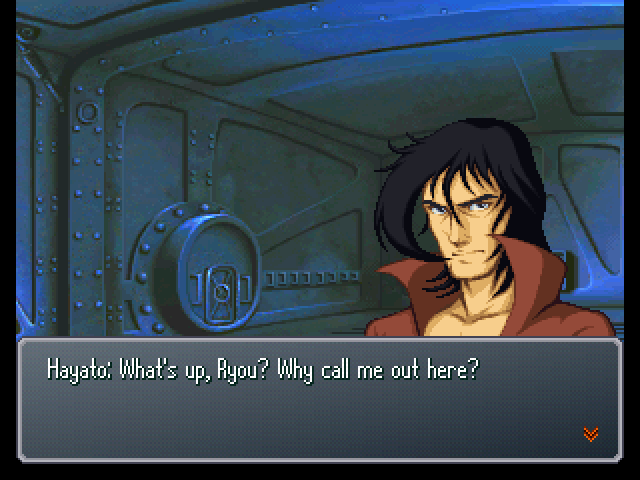 : ...Not another word, Ryou. : Heh... You pulled through decisively at the last moment... It's true, you're the leader the Getter Team needs. : I'll be counting on you from here on out, Leader. 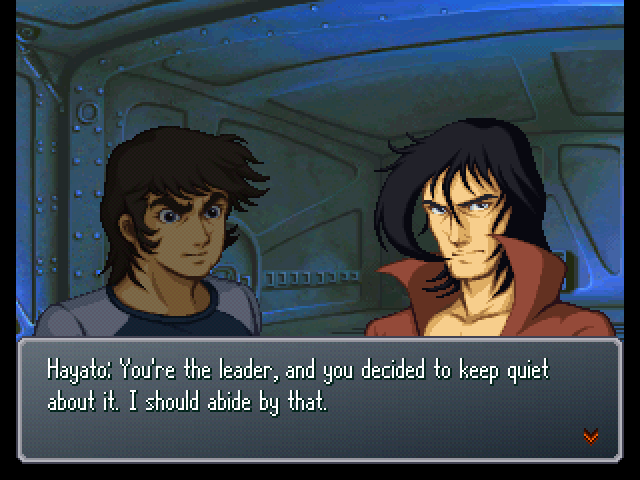 : Likewise, I'll be counting on you, Hayato. 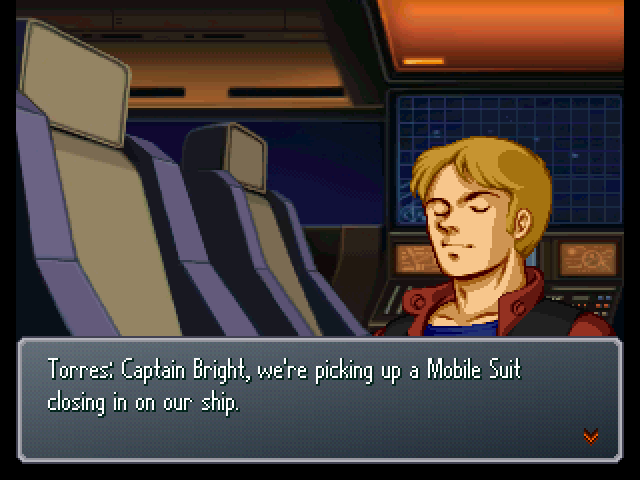 : A Mobile Suit? Is it the Moon Race? : One in number... Identified as a Diana Counter unit, a SUMO. : A SUMO? Those are the royal guard's personal units. : And, just one of them? Torres, send out a unit to intercept it. : Does that mean it's not here to start a fight with us? : But can we trust it? 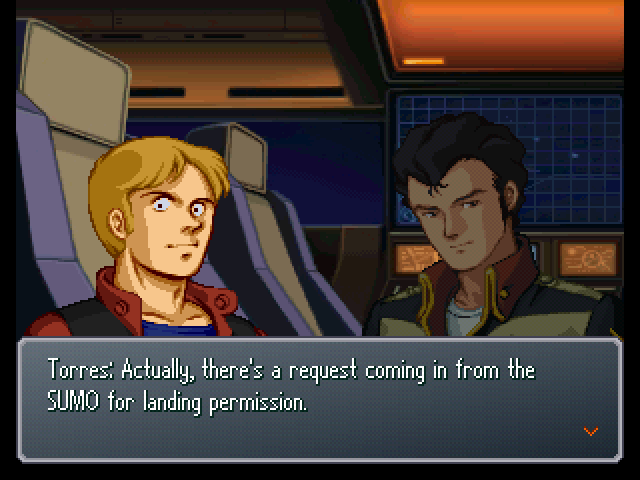 : (.........) Have the Mobile Suit land outside the ship. We'll meet the pilot there. : Why did you cross the ocean to come to us all the way in Gallia? : I can't imagine a soldier of your level deserting or committing treason. : (...That Loran Cehack boy hasn't told them about Lady Diana...? Then it would be prudent to avoid unnecessary confusion.) I've come here... to deliver a letter from Lady Diana to Arthur Rank. : Yes, a request for peace negotiations between the Diana Counter and the Innocent. : Then, why did you contact us? : Lady Diana conjectured that your group would be certain to seek contact with Arthur Rank. : We can't put our trust in you yet. : After all, it is entirely possible you'd want to infiltrate our ship for some other strategic objective. : There is one thing I would like to make clear... 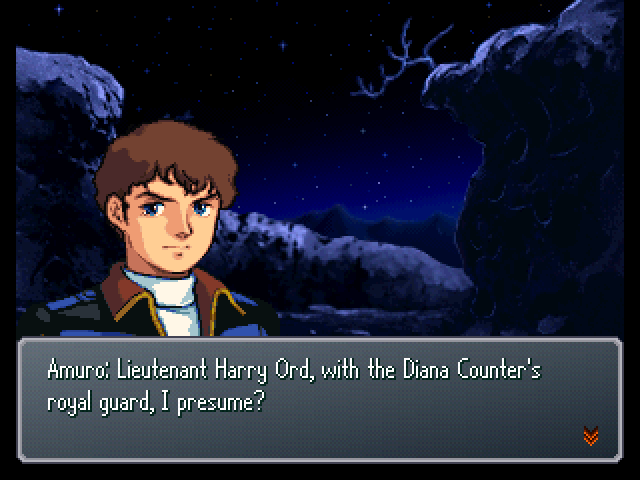 The only one whom the royal guard answers to is Lady Diana. We follow no one else's orders. 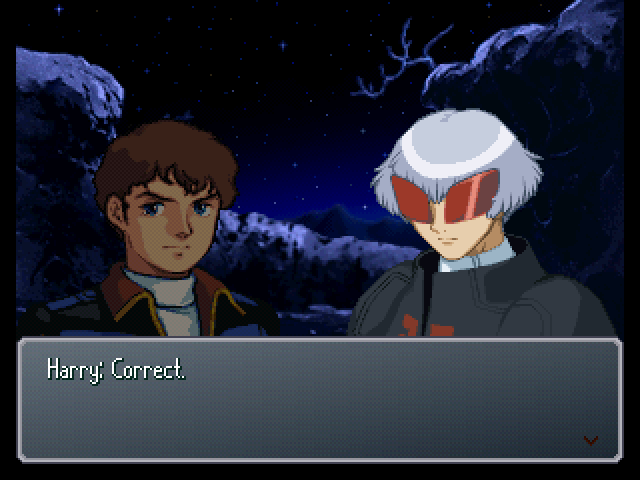 : What is it, Loran? : Yeah, that is true. : Bright, I also think that we can trust him. Besides, having former enemies join forces is something that we deal with all the time. : ...Very well. Lieutenant Harry, I'll permit you to accompany us.